This is a fabulous quilt for using up scraps…and since my inbox was full of questions about it I figured I’d post a quick free pattern. I’ve seen many antique quilts in this pattern. It’s been around forever…and is a great way to use up extra strips, squares, or extra pre-cuts you have lying around. If you want a more detailed version of this pattern with yardage requirements, sizes, and color options, you can find a pattern in my shop. Step 1: Sew each of the color 2 1/2″ strips to a white 2 1/2″ strip. Chain piece to save time!!! You should have 20 strip sets when your done. Press seams towards the color fabric. Step 2: Cut each of the strip sets into 16 units 2 1/2″ x 4 1/2″. You can cut 2 or 3 strip sets at a time to speed things up! Step 3: Sew the units together to create four patch blocks. Press the seam in either direction or open. You should have 160 four patch blocks when your done. Step 4: Layout 2 matching four patch blocks, and 2 scrap squares. Sew them together as shown, the arrows indicate pressing direction (press the last seam in either direction or open). Repeat until you have 80 blocks. Step 5: Assemble the blocks into 10 rows of 8 blocks each. I didn’t worry about creating locking seams…a pin in the seam while you sew will help the seams match and everything should line up nice and neat! Step 6: Sew the blocks together to form the rows. Press seams, alternating directions with each row. Sew the rows together to finish the quilt top. This quilt is a perfect Picnic Size. More sizes and detailed material requirements can be found in a detailed pattern here. 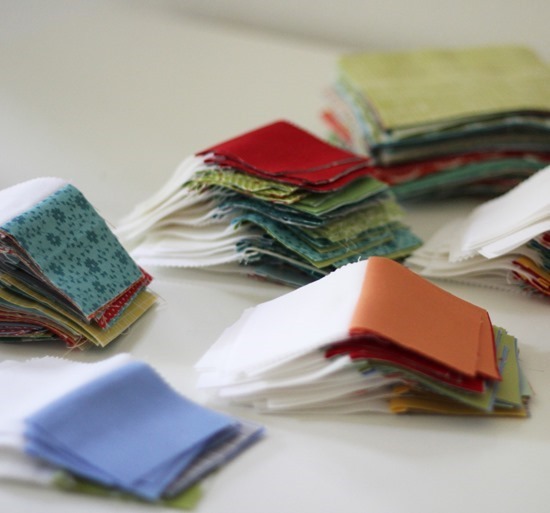 Now go sort through your scraps…and happy summer quilting! I've got a ton of 4" i-spy fabrics that this would be perfect for. Should I cut my strips to 2" or 2 1/4"? Thanks! Cut them to 2 1/4" Emily! With the 4" squares that will leave you with a 7 1/2" unfinished block. I love this quilt and pattern. I think I will have to try this for a quilt for my husband! It would be perfect for him! Thanks for doing this. Wow Allison Thanks this is perfect for beginners..:0) I appreciate your work so very much. Ooh that's gorgeous. My sister just gave me loads of offcuts from vintage sheets (she loves thrifting). I think I now know what to do with them! Yay! This looks like an easy fun project for all those little scraps I've accumulated! It will go into my "to-do" folder. Thanks for the tutorial! Great job. Your quilt is so gorgeous! So fresh and summery. Thanks so much for the instructions! Thanks for the lovely instructions! Perfect for scraps – you are always to generous to give freebies! Thanks! Just printed the tutorial.Thanks for a great idea for my scraps. What a great quilt. Thanks for sharing the tutorial. Thanks Allison. My cousin wants to do a quilt, has never done one…we are getting together in Island Park this month. I think I will make her a kit with my stash and we can go to town on this GREAT quilt! Lovely quilt – thanks for sharing the pattern! What a great quilt! Thanks for sharing your method for making it! What a DUH moment! You make it look so simple when my brain was making it so difficult. Thank you so very much for posting this fun and refreshing quilt pattern! Thank you for the tutorial! 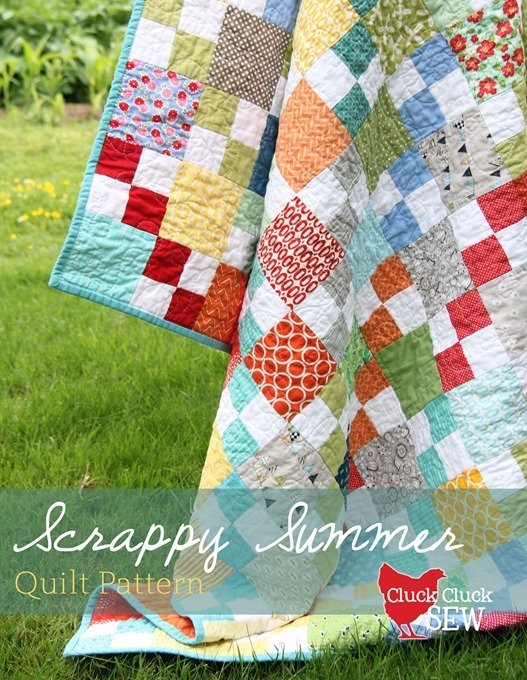 Perfect for my own "summer of scraps" efforts this year! I made a scrap quilt like this years ago, no set colors or print design & it is by far my favorite one out of all the many quilts I have made, just so cheery & colorful. Thank You so much for the pattern. ♥ your Blog. Hi! This is so beautiful and adorable quilt! Tahnk you for sharing the pattern! I love your colours and fabrics! Wow! Thanks you for the lovely pattern! Thank you. It's a quilt very nice. Thank you! You're the greatest & we appreciate your tutorials & free patterns!! 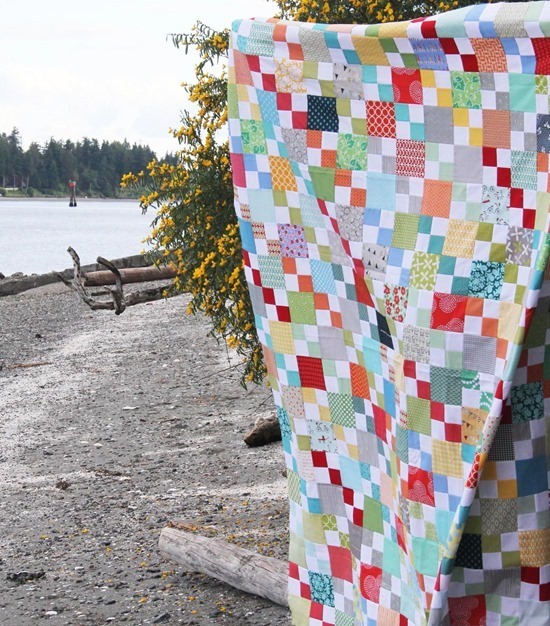 What a fabulous way to use up the scraps – it would be so much fun to have the other quilts I've made represented in one, especially those I made to give away. 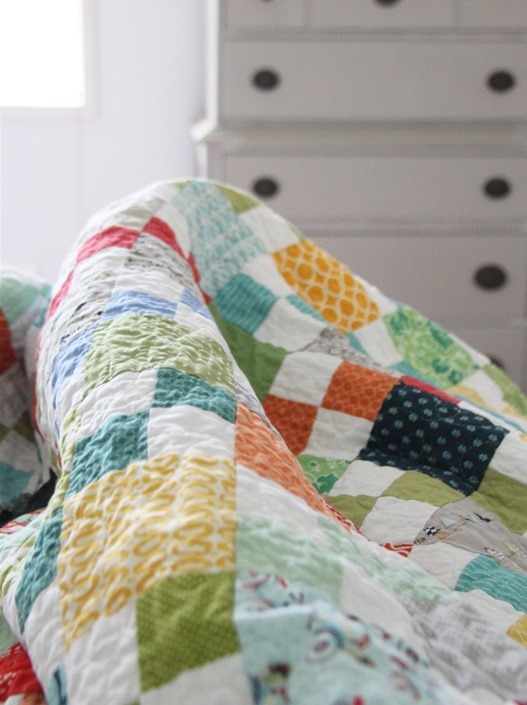 I adore your blog and quilts that you make.. I love to have more time to make things, maybe in my next life? thank you for the instructions, i save them for my next life! there is nothing you touch that I don't love! thank you for your generosity in sharing your patterns with us–free or otherwise! Thank you for posting the tutorial! I was just gonna try to figure it out and forgot about the strip piecing for the smaller squares. I am trying to work through my stash and scraps in the next few months before I start buying more. No where to put the more! Thank you for sharing your pattern, that is so sweet of you. It is a cute quilt and I love how scrappy it is! Thank you so much. I was looking for something scrappy to make for my son before he returns to school in the fall. This will be perfect. You are such a kind soul! As soon as I saw this quilt last week, I got started on my own. I like figuring out my own piecing layouts (math nerd), but I bet there are many who would pay $5 for a PDF version from you. I sure enjoy the freshness in all your work!! Thank you so much for sharing. Love your quilt and I can't wait to start cleaning out those scraps. Great tutorial for a lovely quilt. Thank you! I love it! It is so cheery. Plus, there's nothing better than using up scraps and loving the finished product. I remember the first time I started following you. You had some free patterns and here you are again sharing with us. You are and will always be my favorite blog. I look forward to your fabric and even more patterns than I now have, why because of you! Thank you for the pattern and thank you for being such a genuine, wonderful person!! I was wondering — what do you use to make the little drawings showing how the blocks go together? 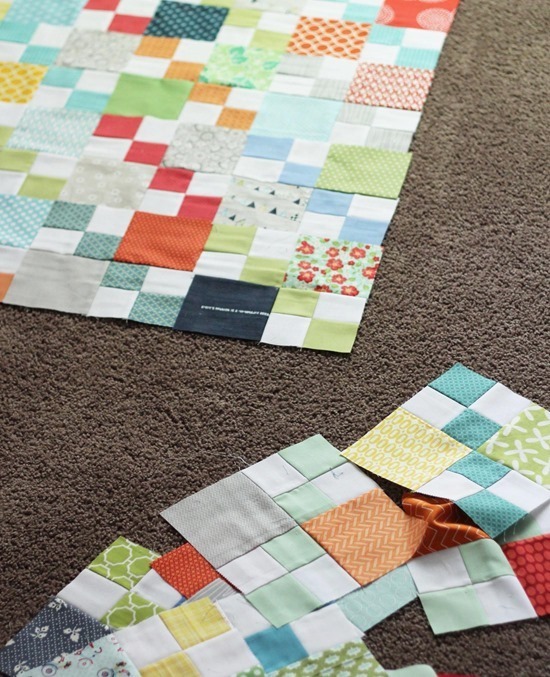 I sometimes just make quilts for myself, and then after I show them on the blog people want the pattern…. and I don't usually take "in process" pictures when I'm "in the zone" if you know what I mean! I'd love to be able to do a quick drawing for people in those cases. Is there software just for that? Or do you draw everything by hand in Illustrator or something? Thank you Thank you Thank you! This is the perfect quilt for me right now. Just was given two large boxes of printed fabric cottons that came from a curtain manufacturer….yippy! Want to make new boyfriend a quilt for his newly painted bedroom….you rock! So simple and so absolutely yummy. Thanks for the wonderful inspiration. Just made this. Thank you so much for the clear and concise tutorial. I love the colors you use and love your quilts. Very generous of you. I cut a huge pile of 4.5" squares one day and haven't been sure what to do with them until now! Thanks for sharing such a gorgeous pattern. Love it Allison! I have very few scraps but I do have lots of charm packs! Thank you for your kindness. What a wonderful easy pattern for my stash of squares and strips. Thanks for sharing and inspiring! You make such gorgeous quilts they are a real inspiration. Love the great materials use and sharing a tutorial. Thank you very much I love scrappy quilts the best. Hi Sandra! That is the quilting part you are referring to. Google “Free Motion Quilting” and you will find lots of great info and tutorials on you tube to learn how to do it!